Today is celebrated around the world the World Hijab Day. It's not an Islamic celebration, but this date was created in 2013 by Nazma Khan as a movement to create awareness against misconceptions and discrimination, and recognize the rights of millions of muslim women who choose to wear the hijab. Last year, 2017, World Hijab Day became a nonprofit organization. On this day, 1st February, women (non-hijabi Muslims and non-Muslims) are invited to experiment the hijab for one day and share their photos on social media as a way to show support and promote religious tolerance and understanding. If you are reading this and are not a muslim, let me explain what hijab is. For many people, the hijab is seen as a symbol of segregation and oppression. However, this is a misconception. The act of covering by a muslim woman has to be her own choice. It's her free will to do it. If a country makes it obligatory as a law or a parent force a daughter to wear it, they are not following Islamic teachings. But it's also wrong to forbid women from wearing it, be it by their parents, or a workplace or their school environment. It's their religious right, the same way it is for Catholic nuns and some Jewish women that also cover their heads. Hijab is an Arabic word that means barrier/partition. In Islam, it has a broader meaning. It's a barrier for everything that can be considered wrong or dubious. It's about modesty and it's for both male and female. The concept of modesty in Islam doesn't only include the way we dress but also includes our behaviour, what is in our heart, what we say, what we think and even our gaze. As a matter of fact, in the Quran (our religious book), men are the first to be ordered to lower their gaze, and only then, women are ordered the same. The headscarf is only a tiny part of what Hijab really represents. The more accurate word for the headscarf would be Khimaar. However, nowadays, hijab became a popular word to refer to the Islamic veil. The definition of modesty can differ for different people, for each religion and even between Muslims, but at the end of the day, it's a choice. Whatever we decide, it can't be done to please others. And when it comes to the choice to wear the hijab, it has to be for Allah (God) only. I started wearing the hijab about one or two weeks before my shahada (declaration of faith - official conversion day), in 2013. I knew in my heart that I was a muslim since many months before, but I took the time to feel prepared and ready to come out to my Christian Catholic family with my decision. The last step for that was to find out how I would feel wearing the hijab. That's why I started wearing it before my conversion. I wanted to make sure I would feel comfortable and confident enough with it. I always knew that it had to be my choice and that some muslim women didn't wear it. But, as we know, the hijab is the most visible declaration of our religion as a muslim woman. And I remember being so happy to become a muslim that I wanted everyone to see me like that, especially my family and friends. I didn't mind what people would think and I didn't really think about the consequences at the time. I was living in a neighbourhood in London surrounded by Muslims. I felt part of the community and during that year, I haven't experienced any kind of prejudice from the people who weren't Muslims. Or maybe I didn't pay attention because of my beginner's excitement. (I experienced some few discrimination episodes when I went back to London later on, but that is a story for another time). By consequences, I mean, the time I would have to come back to Brazil and face the reality. The fact that we have a really tiny community of Muslims here, especially on my city Recife, compared to London. The fact that I would constantly be seen as an alien every time I left my home. Having to deal with the jokes, the curious and sometimes hateful stares. People asking if I were from Afghanistan or from Osama Bin Laden's family. People calling me bomb woman. And so on. The fact that it becomes tough to make new friends or keep the ones you already have because it's hard to find a genuine friendship who don't mind about your religious views or the fact that you don't drink alcoholic drinks and don't go with them to a bar/pub, nightclubs and wild parties. Don't get me wrong, I know that there are really nice people out there that don't care for those things. The fact that it's extremely difficult to find a job as a hijabi woman. I could go on and on. It's really a challenge to wear the hijab in a country like Brazil and it makes me struggle with it daily. There are times when I just want to go out and be invisible, not having to face the stares and judgments. It's one of the reasons why I've been wearing more turban styles than a traditional hijab style lately. It's really hard when you feel alone and you don't see other girls like you in your daily life, other than on social media. So, you can ask: If you feel like that, why do you keep wearing it? Whenever I think of taking my hijab off, I also think that I shouldn't let racism and discrimination win. Only by wearing it I can create awareness and help to fight for our rights. There are many other girls feeling the same way as me. It's who we are, it's part of our identity. So why should we change it to please others? The hijab also made me stronger and much more aware of all the prejudices and unfairness that exist in the world against all minorities. It opened my eyes to so many injustices. From a spiritual perspective, the hijab is a constant reminder of how I should behave giving me a sense of boundaries. Having the scarf on my head keeps me constantly aware of my actions, helping me to always try to be the best version of myself. It is also a way to educate others and show with my behaviour what Islam is really about, and not what the media chooses to portray, like a religion of extremist people or an exotic culture that should be explored in your next vacation. Overall, It helps me to feel more connected to my creator, as I'm doing it for Him only and not for the people. The hijab doesn't give me any kind of limitations. We cover our hair, not our brains. We are capable of doing anything we want as anyone else. The only thing that could stop us from doing something is the prejudice of others. My hijab also gives me the freedom of the beauty standards that society dictates, allowing me to focus on other less superficial aspects of my life. It also avoids society sexualizing my body and focusing more on my mind and intelligence. I don't want you to have the idea that because I wear a scarf I think I'm better than someone who doesn't wear it. I truly believe that you don't need a scarf to be an amazing human being. Be unapologetically you! But do it for you and never to please society standards. Stand true to what you believe! For myself, I chose the hijab, and I think my choice should be respected. It's part of my identity, it makes me feel empowered and it also helps me a lot on my spiritual journey. Right now, I'm still strong in my choice. I don't know for how long. Even, if I have to take it off one day for a job and/or out of necessity, hijab will always be part of me (literally, because we always wear it to pray or to go to the mosque). Although, I truly hope, In sha Allah (If God wills), I won't need to let discrimination win. I finally filmed my first hijab tutorial. I actually did it some months ago, but I only had the courage to share it now. 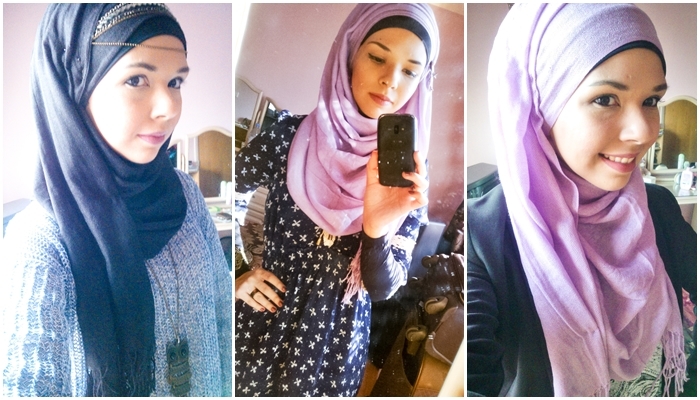 It's a simple chiffon hijab style, and I tried to recreate the one I wore for the lookbook I filmed a while ago. You can check that lookbook video here and the blog post here. For this tutorial, I used a chiffon scarf from iCovered, a black bonnet cap (underscarf), 2 simple pins and 2 safety pins. You don't really need all those pins, but I really like using them to keep the scarf secure, as chiffon scarves can slip easily from your head. I hope you like it! It was just my first attempt doing it, so bear with me, haha.